SANTA BARBARA, Calif. — Santa Barbara County Air Pollution Control District and Santa Barbara County Public Health Department encourage residents to be proactive and plan for poor air quality conditions when wildfires occur and smoke is present. The smoke and ash from wildfires is made up of very small particles known as particulate matter, or PM, which can cause health issues, especially for children, seniors, pregnant women, and people with heart or lung conditions. If advised to stay indoors, keep your windows and doors closed. If temperatures are high and you do not have a way to keep your home cool with the windows and doors closed, consider temporarily relocating until conditions improve. Create a “clean air room” in your home where you can set up a High Efficiency Particulate Air (HEPA) cleaner; a room where you spend a lot of time, such as a bedroom, is one suggestion. A HEPA air purifier can reduce the amount of harmful particles in your indoor air by approximately 90 percent, according to the California Air Resources Board. HEPA purifiers are available in various makes and models for various room sizes. Filters on HEPA air purifiers should be checked frequently and replaced as often as is indicated in the unit’s owners’ manual. It may be necessary to replace the filters more often if the cleaner is used during a wildfire. The California Air Resources Board keeps a list of air purifiers confirmed as safe and legal for sale in the state: https://www.arb.ca.gov/research/indoor/aircleaners/certified.htm. A less expensive option involves attaching a filter to a box fan: https://www.youtube.com/watch?v=kH5APw_SLUU. If you are unable to keep your indoor air clean during a wildfire, consider relocating to an area where the air is cleaner, even if only for a few hours. Symptoms of smoke exposure include coughing, wheezing, shortness of breath or difficulty breathing, chest tightness or pain, nausea, and unusual fatigue or lightheadedness. Talk to your doctor if you experience symptoms. During wildfires, it is important to pay attention to local air quality conditions and stay alert to smoke-related news coverage or health warnings. You can sign up to receive air quality advisories on the Air Pollution Control District website. The District provides hourly updates on regional air quality conditions throughout Santa Barbara County and measures for particulate matter (PM10 and PM2.5) and ozone, or smog. During wildfires, smoke and ash generally lead to elevated levels of PM2.5, which are harmful, invisible particles, and elevated levels of PM10, which are larger particles that can get broken down into smaller particles over time. Find more information on smoke and health, including a graphic illustrating the size of PM2.5 and PM10. 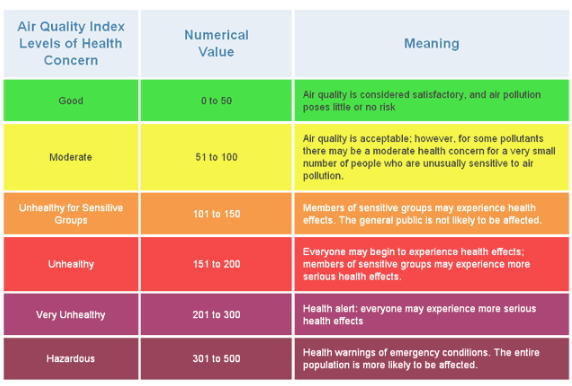 You can check the conditions by looking at the Air Quality Index (AQI) chart. The AQI translates pollutant measurements into a more visual look at air quality conditions. You can find the local AQI for current conditions and forecasts on Today’s Air Quality. The higher the AQI value, the greater the level of air pollution, and the greater the health concern. The colors also help show the different levels of health concern. An AQI value of 100 represents the federal health standard for that pollutant; any value over 100 is unhealthy for sensitive groups, and unhealthy for everyone the higher the number climbs. For PM10, measurements above 150 micrograms per cubic meter are unhealthy for sensitive groups (which corresponds to the orange AQI level). For PM2.5, measurements above 35 micrograms per cubic meter are unhealthy for sensitive groups. For ozone, measurements above 70 parts per billion (ppb) are unhealthy for sensitive groups.